All the parts needed to construct a Mechanical Insect and the 2-channel remote control are provided. This robot kit is equipped with two gearboxes, one that controls the right legs and one that controls the left legs. While working in the same direction, the gearboxes allow your robot to move forward or backward. While working in opposite directions, the gearboxes allow your robot to turn right or left. The remote control allows you to control the two gearboxes; each lever controls one gearbox. After some practice, you will be able to make your insect go anywhere you want. The Mechanical Insect’s body is made from a transparent blue ABS resin that allows you to see all of the motors, gears, cranks, and linkage rods in action. 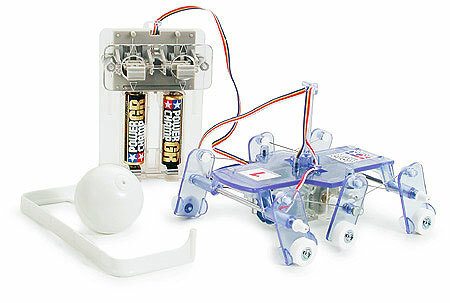 The kit includes a ball and parts to build goals, allowing you use your Mechanical Insect to play soccer with friends. Stickers with numbers are also part of the set so you can organize a full competition. To play soccer, you just need to make a rounded field with fences and draw lines on it. Then take two Mechanical Insects as players and you are ready to start. By pushing the ball with the legs of your robot, you can dribble and score goals. Note that only one Mechanical Insect is included in this kit. Continuous running time with Alkaline battery: 2 hrs.